Pebble Technology brought the smartwatch into prominence back in late 2012 when the company raised over $10 million on the crowdfunding website KickStarter for its Pebble Smartwatch. Looking to stay relevant and on top in the increasingly crowded smartwatch market, Pebble added a new (not that new) watch to their ranks: the Pebble Steel. Does the Steel have what it takes to be the perfect smartwatch? Find out after the break. 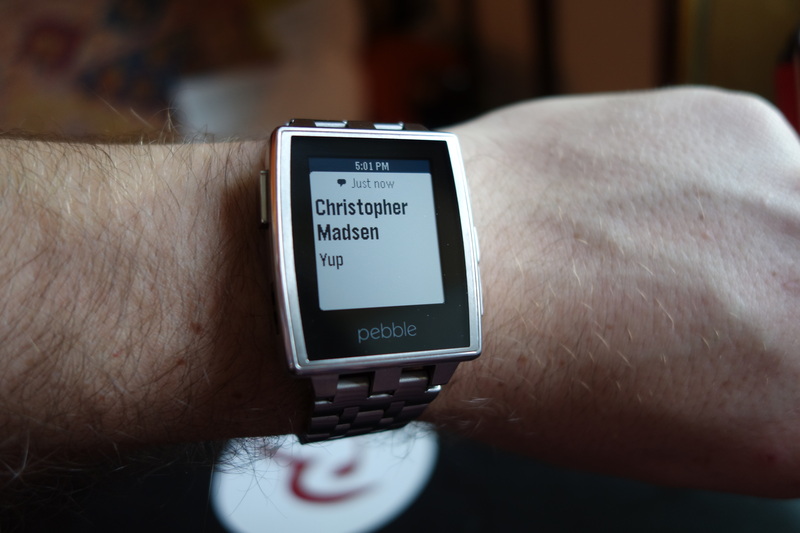 I wrote a review for the OG Pebble Smartwatch last year and I really liked it. Made of durable plastic paired a silicone band, the $199 Pebble was light-weight, waterproof, pretty slim, and came in a variety of colors. However, its build reminded me of a rectangular sports watch or calculator watch. For $18, I pimped my Pebble out with a silver watch face sticker and a brown silicone band to make it look less geeky. The Pebble Steel gives the device a much needed makeover. From the moment you open the pebble embossed lid on the black faux leather box, you feel important. The Steel The Steel is constructed out of stainless steel and Corning Gorilla Glass (the same scratch resistant glass used in smartphones), is available in brushed steel or matte black, and comes with both black leather and metal bands. While the Steel is a tiny bit heavy, it has a smaller footprint than its plastic twin. Yes, you heard me right: twin. For $249, the Pebble Steel definitely looks new, but inside, you’re getting the exact same watch. That’s not really a bad thing though. You get the same LCD e-paper display, same processor, same 7 day battery life, same Bluetooth LE connectivity, and same 5 ATM waterproof rating, although you’ll want to wear the metal band if your want to shower with it . Instead of relying on a touchscreen like the Samsung Galaxy Gear or the Qualcomm Toq, you navigate the list-style interface using four buttons. The button on the left side of the device is a back button. The top and bottom buttons on the right side are up and down buttons, while the center button is a select button. The Steel is not trying to be a watch-sized smartphone. Just like the original, simplicity is its strength. The abilities of the Steel fall into three categories. First of all, it’s a watch. From within the new Pebble app, you can pick from hundreds of watch faces. Some are analog. Some show various forms of date. Others feature your favorite video game character, your favorite television character, or your favorite sports team. Some watch faces even display the current weather on them. Many individual watch faces have options to change how information is displayed and to turn off certain features. I found the best looking watchfaces in a separate app by developer and designer ttmm, which has both free and paid watchfaces. Second, the Steel is your notification center. When you receive a text message, phone call, email, Snapchat or anything else, your watch vibrates and part or all of the message appears on the screen. On Android, you can pick which apps can send information to your Steel with apps like Pebblify or Pebble Notifier. You don’t get that much control on iOS, so you’ll have to turn off notifications in general to certain apps if you don’t want it to be sent to your wrist. When someone calls, you get the option of sending it to voicemail just by pressing a button and can accept calls if you have an iPhone. However, you cannot take calls from the Steel since it lacks a speakerphone. If you wear your watch to bed or keep it on nightstand near your bed, you can set Do Not Disturb hours so your watch doesn’t vibrate during the night. You can also have only phone calls notify the Steel. Lastly, the Steel has apps. The Alarms app and Music app come built-in. The former allows you to set multiple alarms, while the latter allows you to use your watch as a remote for any media playing on your connected device. You can pause/play and skip forward and backward in your music queue when you’re playing music on your bluetooth speakers or listening to tunes while you run. Best of all, I found I could use my Steel in conjunction with Chromecast, so I can pause what I’m watching on my TV, like the newest episode of HBO’s True Detective, straight from my wrist. The Pebble app store is filled with many simple stand-alone apps like timers, stopwatches, calculators, scorekeepers, etc. Other apps are extensions of apps on your phone and can act as simple remotes for those apps and/or display information from those apps. For example, if you RunKeeper to track your runs, your Steel will display customizable information like distance ran, distance left, average pace, current pace. However, if you want a watch to run with, I’d suggest the OG Pebble, which is still being sold on their website. The Steel also works with FreeCadie and other golf apps to display the how far you are from the front, middle, and back of the green. Apps like Sleep As Android and Lets Muv use your Steel to track your sleep and wake you up at the right time based on that information gathered. There is even an app that works with Philips Hue lights so that you can turn on and off your Hue lights from your wrist. A few things bother me with the Steel. The backlight isn’t evenly spaced out and the ambient light sensor is finicky and turns the backlight on under fluorescent lighting. I’m left manually turn the backlight on and off. The other small problem I have is more personal. Unlike the strap for the OG Pebble, the Steel’s leather strap just doesn’t quite fit comfortably on my smaller-sized wrist. The watch is either just a tad too big, causing it to slide around a little, or the leather band uncomfortably grips my wrist just a bit too tight. I haven’t had a chance to use the metal strap, since my college is located in the middle of no where in Central New York. While it’s great two bands are included with the Steel, they use an uncommon two prong design, making it harder to find bands that will fit the Steel. Switching bands now requires you to either get a tiny screwdriver like the ones you use on glasses (a 3/64 slotted flathead screwdriver to be exact) or to take it into a watch shop. I thought I’d have to take my watch into a watch shop to have the stainless steel band fitted, but after watching a YouTube video, I found I could just use the same tiny screwdriver to take out the link. While others have complained about the new charging port, I find the change welcome, since I found the proprietary magnetic cable easily detached from the charging pins on the OG Pebble. Also, the Steel is top heavy compared when paired with the leather band. The OG Pebble had a nice even weight distribution due to the lighter plastic parts and the slightly heavier silicone band. However, I found this problem solved when I switched to the metal band. While the OG Pebble could be worn by anyone, the Steel is a men’s watch. Maybe Pebble or another company will make smart jewelry that’s more useful than Cuff’s weird LifeAlert and pager combo. The Steel isn’t the watch for everything and everyday. There is one big difference I’ve found between the OG Pebble and the Steel. When I was wearing the former, I never took it off. I’d feel weird when I didn’t wear it and would end up instinctively look at my wrist when my phone vibrated.I showered with it, slept with it, ran with it. This allowed me to use is to its fullest potential; I used it with my running and sleep tracking apps. While wearing the Steel, I either can’t and won’t do those things. I take it off before I go to bed just like you would a nice watch. Like I said earlier, it also just doesn’t fit as snugly on my wrist with the leather band, which makes me aware of its presence. One of the appeals of the OG Pebble I feel like my OG Pebble is my everyday watch and my Steel is my watch for more formal settings. I haven’t tried running with the Steel paired with the metal band since its been I guess I’m okay with that, but it makes my OG Pebble just feel more useful. Back in early 2013, all smartwatches except the OG Pebble were clunky and chunky with bad battery life , little developer support, limitied platform compatibility. Today, competitors like Samsung are still releasing battery draining behemoth smartwatches that only work with galaxy smartphones. However, the competition is starting to heat up, with MetaWatch teasing a design-focused smartwatch and Samsung announcing the successor to the Galaxy Gear. However, no other smartwatch on the market today has the developer support, platform compatibility, battery life, and content that both Pebble Smartwatches have. If you’re in the market for a classy smartwatch, the Pebble Steel is the only one you should buy.